About 30 different species of aphids can be found in greenhouses, depending on the crop. Aphids are generally less than 1/8 inch long, soft-bodied insects with long legs, long antennae and a pair of tube-like structures call cornicles projecting from the posterior end. Aphids may occur in large colonies on new growth, the base of buds, or the undersides of mature leaves. There are many species of aphids which range in color from greenish-yellow to very dark green, dark brown to black and even pink. Some have wings, which are transparent with very few veins and are held vertically over the body when not in use. Fact Sheet: Common Greenhouse Aphids, C.E. Frank & M. Skinner, University of Vermont, Entomology Research Laboratory 2013. Powerpoint: Tips on Scouting Vegetable Bedding Plants, Pest and Disease ID. Leanne Pundt, UConn Extension. Taxonomic Training Videos: Aphids under Microscope, National Plant Diagnostic Network. Aphids are sucking insects that remove plant sap and cause distorted growth. Aphids void waste as a sugar-rich liquid called honeydew, which attracts ants and promotes growth of black-colored fungi called sooty mold. In addition, some aphids also transmit viral plant diseases. Many aphid species reproduce sexually only under specific environmental conditions, often those associated with the onset of winter. During spring and summer, reproduction is asexual, with unmated adult female aphids giving birth directly to live young, all of which are female. This process, coupled with the high funcundity of many aphids (some species giving birth to as many as 60 to 100 young nymphs over a period of 20 to 30 days) and the quick maturation of aphids (as little as 7-10 days between generations) allows populations of aphids to increase quickly. At high densities, winged females may appear in aphid colonies. These winged individuals then move to new, less crowded host plants. Outdoors, many aphid species pass the winter in the egg stage. In greenhouses, aphids may continue to reproduce asexually, via live birth, indefinitely. Many species are found on only one, or at most, a few host plants. The common aphid species that are encountered in greenhouses include green peach aphid (Myzus persicae), melon/cotton aphid (Aphis gossypii), foxglove aphid (Aulacorthum solani), and root aphid (Pemphigus spp.). The green peach aphid is mentioned most often because of its worldwide distribution, very wide host plant range (more than 400 host plants), virus disease transmission (vectors more than 150 virus strains) and difficulty of control. Green peach aphid: This aphid species can be distinguished from the melon/cotton aphid by the length and color of the cornicles (the tube-like protrusions extending from the end of the abdomen). Green peach aphids have long (approximately the length of the body) cornicles and only the tips are black. In addition, the head has a distinct indentation at the base of the antennae. Melon/cotton aphid: The cornicles on melon/cotton aphid are short (approximately 1/3? or 8.0 mm, the width of the body) and vary in color from light yellow to very dark green (making them appear black). The antennae are typically shorter than the body. Melon/cotton aphids do not have a distinct indentation at the base of the antennae like that of the green peach aphid. Foxglove aphid: Foxglove aphids have green flecks located at the base of their cornicles. In addition, they have black markings on their leg joints and antennae. 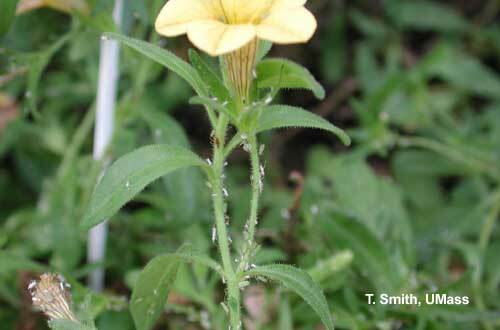 Foxglove aphids tend to fall off plants when disturbed and they can cause severe leaf distortion, more so than the green peach and melon/cotton aphid. 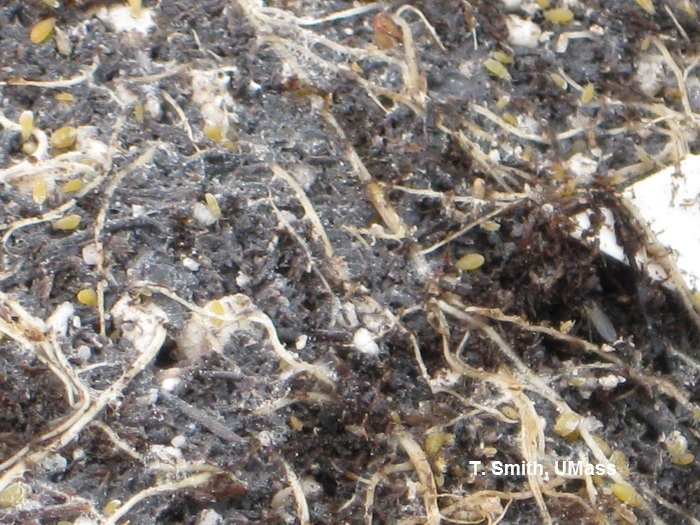 Root aphid: The primary root aphid (Pemphigus species) overwinters as eggs and infests plants in the spring and fall. Root aphids may be misidentified as mealybugs because they are covered with white wax although they are smaller than mealybugs. Root aphids have reduced cornicles that resemble rings, which are located on the end of the abdomen. These cornicles can be seen when magnified. Sanitation is an important part of aphid control. To prevent the introduction of new aphid species into your greenhouse, carefully inspect all new plants before placing them in the growing areas. Eliminating all weeds in or near the greenhouse can be useful because it will help suppress potential reservoirs from which aphids might enter the crop. Winged aphids can easily move from the outdoors into greenhouses through open vents and establish on crop plants. To detect aphids early, several plants on each bench throughout the greenhouse should be checked on a weekly basis, particularly those species of plants that most often host aphids. Inspect the young growing tips, stems and buds of aphid prone plants and note which cultivars are the most susceptible. Signs of an aphid infestation include the presence of white cast (molted) skins, honeydew, and black sooty mold fungi. Yellow sticky cards can capture winged aphids that have entered the greenhouse from outdoors, particularly during spring and early summer. Since most aphids are wingless, the use of yellow sticky cards is not a reliable indicator of the population levels of aphids within the greenhouse. Direct visual inspection of the crop is required. Young aphids of some species may reside between scales of leaf buds or in flowers. This reduces their contact with nonsystemic pesticides and repeated applications may be needed for control. Pest control materials (insecticides) with contact, translaminar, or systemic activity can be used to control aphids. Translaminar means that after application the material penetrates leaf tissues and forms a reservoir of active ingredient within the leaf. This provides extended residual activity even after spray residues dissipate. It is important to rotate insecticides with different modes of action to delay the onset of resistance. Insecticide applications must be initiated early in the cropping cycle, when plants are small. Coverage of plant parts with wettable or soluble powder formulations may be improved by the use of surfactants. In some instances, insecticidal soaps and/or horticultural oils may provide control of aphids, particularly when populations are low. However, since these insecticides kill exclusively by contact and have minimal residual activity, thorough coverage is essential. Insect growth regulators and pyrethroid-based insecticides may also provide control of aphids. Systemic insecticides, including the neonicotinoid-based insecticides imidacloprid (Marathon®), thiamethoxam (Flagship®), acetamiprid (TriStar®), dinotefuran (Safari®), and clothianidin (Celero®), effectively control aphids for extended periods of time when applied early in the cropping cycle. The same is true of the selective feeding blockers, pymetrozine (Endeavor®) and flonicamid (Aria®). A number of insecticides have both translaminar and systemic properties. See the current New England Recommendation guide for more information. Practice good sanitation, such as removing discarded plant material and eliminating weeds around plant production areas. Weed host plants often serve as reservoirs for migrating or ant carried aphids. Avoid excessive amounts of nitrogen fertilizer which promote soft plant tissue. New, soft plant tissue promote higher aphid populations. Use physical control methods if appropriate. These include screens or other barriers. Screens are especially important in stock plant production areas to reduce the threat of virus transmission. Thoroughly inspect all incoming plant material and spot treat if necessary. Aphids have many natural enemies and several groups have been studied as potential biological control agents for release in greenhouse crops. Aphids are susceptible to many natural enemies, both predators and parasitoids, which may serve as effective biological control agents in greenhouses. Aphid predators include ladybird beetles, lacewings, and predatory midges. In general, predators are not as effective in maintaining aphid populations at acceptably low populations, with the possible exception of the predatory midge, Aphidoletes aphidimyza. However, the predatory midge is not effective during short-day conditions. It is important to realize that not all of the commercially available natural enemies reduce aphid populations to non-damaging levels. This is especially true when aphid numbers are abundant due to their rapid rate of development and reproduction. If high aphid populations are present in localized hot spots within the greenhouse or present on only a few plants, then apply an alternative pest control material. The use of alternative pest control materials may not disrupt already established biological control programs for aphids. Furthermore, if aphids are abundant and widespread, scattered throughout the greenhouse, then it will be essential to apply an alternative pest control material in order to reduce the population before releasing any natural enemies. In general, alternative pest control materials do not leave toxic residues that negatively affect aphid parasitoids and/or predators. Ladybird beetles: The convergent ladybird beetle, Hippodamia convergens, and the two-spotted ladybird beetle, Adalia bipunctata, are commercially available from most biological control suppliers. Some greenhouse growers have been known to collect the multicolored Asian ladybird beetle, Harmonia axyridis, from homes to release into greenhouses. Both the larval and adult stages of ladybird beetles feed on aphids. However, they may not distinguish between parasitized and nonparasitized aphids. Adult beetles feed on pollen, fungi, and nectar in the absence of prey. Ladybird beetles are generalist predators and, in addition to aphids, feed on thrips, whiteflies, mealybugs, and scales. Because ladybird beetle adults can fly, they are difficult to establish in greenhouses. If used, it is recommended to release ladybird beetle adults in the evening, near aphid colonies. Repeat applications may be needed. When scouting the crop, look for aphids that have been fed upon and ladybird beetle adults, larvae, and/or eggs. Eggs are typically bright yellow and are laid in clusters near aphid colonies. When just starting out using biocontrol agents, many growers first think about using the well known and familiar "ladybug" (Hippodamia convergens) for aphid control. Ladybird beetles are relatively inexpensive and can be stored in the fridge. However, there are some concerns with using adult ladybeetles to control aphids. Wild collected ladybeetles for sale are field collected from mountainous areas of the west coast states where the beetles migrate and aggregate in large masses. Beetles are highly dispersive and once released in greenhouses, most will leave, providing little or no control. Another concern is that harvested lady beetles may have been parasitized by a small wasp that develops as an internal parasite and kills them. And finally, Microsporidia, a disease of ladybugs, has also been detected in some shipments. Green lacewing: The green lacewing, Chrysoperla rufilabris, is adapted to the environmental conditions typically present in greenhouses. Adults are usually active at night and feed on nectar, pollen, and honeydew. Green lacewing larvae (referred to as 'aphid lions') feed on many aphid species as well as mites and whiteflies. The larvae, which are cannibalistic, must be distributed over a wide area throughout the production facility. Larvae may survive better than eggs. You should observe a reduction in the aphid population after approximately two weeks. Repeat applications are typically required, and control may be hampered if low aphid populations are present. Scouting for green lacewings is difficult because the larvae tend to hide within the plant canopy during the day. Examine leaf undersides for the presence of eggs laid on extended stalks. Predatory midge: The predatory midge, Aphidoletes aphidimyza, feeds on over 60 aphid species. The midge is nocturnal (active at night), and prefers to reside in dark, humid areas near the lower plant canopy. Only the larval stage is predacious. Adults feed primarily on pollen and honeydew. The bright orange larvae kill aphids by biting their knee joints, injecting a paralyzing toxin and then withdrawing the internal body fluids. Aphidoletes aphidimyza is typically sold as pupae. Adults that emerge from the pupae lay eggs near aphid colonies. Larvae descend to the ground (below greenhouse benches) to pupate, so this predator may be less efficacious in greenhouse facilities with concrete floors. Aphidoletes aphidimyza is most effective during the summer because exposure to short days and low temperatures during winter induces diapause, which is a resting stage. Initiate releases early in the morning or evening near aphid colonies. Greenhouse temperatures should be 60-80F (15-26C), with 50-85% relative humidity. Aphidoletes aphidimyza may be used preventively in combination with aphid parasitoids. When scouting, look for fed-upon aphids, which may appear shriveled and brown or black. The adults are rarely observed since they are active at night. In general, parasitoids are more effective than predators in reducing aphid populations, although parasitoids may fail to provide acceptable control under warm conditions or at times when aphid populations tend to increase rapidly. Four parasitoids are commercially available. Aphid parasitoids are host-specific in terms of the aphid species they attack. For example, Aphidius ervi attacks foxglove aphid, while Aphidius colemani attacks both green peach and melon aphids. Mixtures of different parasitoid species are commercially available and should be used when multiple aphid species are present. Parasitoids are shipped either as adults or 'aphid mummies' from which parasitoid adults soon emerge. To increase the parasitoids' effectiveness, place small groups of the aphid mummies in cups near aphid colonies. Do not let these aphid mummies get wet. Release rates may vary depending on the parasitoid species. Containers often contain approximately 250 aphid mummies, which can treat 5,000 ft2 at the high release rate or 25,000 ft2 at the low release rate. Greenhouse temperatures should be 65-77F (18-25C), with 70-85% relative humidity. Aphid parasitoids must be applied preventively to suppress aphid populations. They are less effective when aphid populations are high and already causing plant damage. Release parasitoids on a regular basis to sustain their populations during the growing season. Remove yellow sticky cards before releasing parasitoids, as sticky cards attract and capture parasitoids. When scouting, look for aphid mummies that have circular holes on one end. These are the exit holes created by adult parasitoids during emergence. Aphid parasitoids are sensitive to pest control materials. For example, direct sprays and one-day old residues of kinoprene (Enstar II®) are harmful to A. colemani . Direct applications of spinosad (Conserve®) are also toxic to A. colemani. Release parasitoids preventively on crops you know are susceptible to aphids, so that the parasitoids will be present when aphids are first noticed. Also, identify aphids to species before ordering parasitoids, since parasitoids are selective in the aphid species they attack. For example, release Aphidius colmani for green peach aphid, and Aphidius ervi or Aphelinus abdominalis for foxglove or potato aphid. Some biological control suppliers sell mixtures of parasitoid species, which may be useful when several aphid species are present in the greenhouse simultaneously. Banker plant systems may be useful in controlling aphids and reducing the costs associated with applying pest control materials. Banker plants support colonies of aphids that are not greenhouse crop pests, along with parasitoids. Information on banker plants is available at:http://negreenhouseupdate.info/ (type in banker plant in the search tool for details). Also see the fact sheet: Aphid Banker Plant System for Greenhouse IPM, Step by Step (from UVM and Biobest). If aphids are already abundant then you must reduce their numbers before releasing natural enemies. You can reduce aphid populations by applying the pest control material pymetrozine (Endeavor®), which kills insects with piercing-sucking mouthparts, including aphids. Endeavor® has been demonstrated to be compatible with aphid and whitefly parasitoids, and predatory mites used to control thrips and spider mites. Do not attempt to suppress high aphid populations with predators, as this is typically not effective. Entomopathogenic fungus: The entomopathogenic fungus, Beauveria bassiana, is commercially available for use against aphids. However, because aphids have high reproductive rates and molt rapidly, especially during the summer, repeat applications are typically required. Beauveria bassiana is most effective when aphid populations are low. This fungus may not be compatible with the convergent ladybird beetle (Hippodamia convergens) depending on the concentration of spores applied. Table 1. Some insecticides registered for aphid control in greenhouses , listed by mode of action group. chlorpyrifos (DuraGuard ME) Most greenhouse ornamentals. Microencapsulated, extended release formula. Two sprays at 7-day intervals. Direct spray to some open blooms may cause petal drop. Orthene TT&O 97) Most greenhouse ornamentals. Use alone, or combine with a pyrethroid insecticide. See label for plant safety. Greenhouse ornamentals and interiorscapes. Can be used alone, but seems to work best when combined with other products. Note: Pyrethrins are not labeled for interiorscapes, but are labeled for herbs and vegetables. imidacloprid (Marathon, many generics) Greenhouse ornamentals, vegetable plants and interiorscapes. Read labels for details. Long-residual systemic insecticide. Control may not be apparent for 1-2 weeks after application, but if applied correctly should last for 8 weeks. Good root system needed. Aphids in open flowers are not controlled. acetamiprid (TriStar) Greenhouse ornamentals. See supplemental label for use on vegetable transplants. Contact insecticide with translaminar activity. dinotefuran (Safari) Greenhouse ornamentals, interior plantscapes and vegetable transplants. Contact and systemic insecticide. thiamethoxam (Flagship) Greenhouse ornamentals and vegetable transplants. Systemic insecticide. flupyradifurone (Atlas) Greenhouse ornamentals and greenhouse vegetables and transplants. Systemic and translaminar insecticide. abamectin (Avid, Abamectin, generics) Greenhouse ornamentals with exceptions - read label for plant safety. Insecticide with contact and translaminar activity. For suppression of aphids. Thorough coverage is important. kinoprene (Enstar AQ) Greenhouse ornamentals and interiorscapes. Insect growth regulator. For aphid suppression. fenoxycarb (Preclude TR) Greenhouse ornamentals. Insect growth regulator. Total release. pyriproxyfen (Distance) Most greenhouse ornamentals, fruiting vegetables and interiorscapes. See label for plant safety. Insect growth regulator. For aphid suppression. pymetrozine (Endeavor) Greenhouse ornamentals and interiorscapes. Systemic and translaminar activity. Aphids stop feeding within hours but remain on plant for 2-4 days. flonicamid (Aria) Greenhouse ornamentals and interiorscapes. Contact and systemic insecticide. Aphids stop feeding immediately, but may remain on plants for 5 days. azadirachtin (Aza-Direct, AzaGuard, Azahar, Azatin XL, Molt-X, Ornazin) Greenhouse ornamentals, herbs and vegetables. Some labels have interiorscapes. Insect growth regulator. cyantraniliprole (Mainspring) Insecticide with systemic and translaminar activity. Begin treatments prior to establishment of high pest pressure and reapply as needed. Soil application should be made prior to anticipated pest infestation to allow adequate systemic movement and to achieve optimum levels of control. insecticidal soap (M-Pede) Many are labeled for greenhouse ornamentals, herbs, vegetables and interiorscapes. See label for details as some products may not be labeled for vegetables and herbs. Soaps and oils kill by contact so thorough coverage is needed. See label for information on plant safety. Chromobacterium subtsugae Strain PRAA4-1 (Grandevo PTO) All greenhouse ornamentals (organic). Contact biological insecticide for young immature stages. Thorough coverage important. *Modes of action - Resistance Groups (number and letter) indicate products with a common mode of action based on the Insecticide Resistance Action Committee (IRAC) guidlines at http://www.irac-online.org/ For multiple applications to one crop, select products from different resistant groups. Gilrein D. 2014. What You May Not Know About Aphids. Greenhouse Management Magazine. Lindquist R. Attacking Aphids. Greenhouse Grower. August 1998 144-153. Pundt L., Cloyd R. and Smith T. New England Greenhouse Pest Control and Growth Regulator Recommendations. Section B, Insect and Mite Management. New England Floriculture Inc.
Prado S.G., Dale A.G., McClure T and S.D. Frank. 2013. Optimizing Banker Plant Systems for Aphid Biological Control in Floriculture Greenhouses. North Carolina State University. Special Research Report no. 217, American Floral Endowment. Sullivan C. and M. Skinner Hyperparasites of Aphid Parasitic Wasps. University of Vermont Entomology Research Laboratory. Smith T. and Taranto L. 2015. Scheduling Biologcials.